The Motorola M800 Bag Phone is a powerful communications tool for workers who need to stay connected in the most remote locations. This powerful unit is a fully integrated carry-case solution featuring a built-in, durable hands-free M800 mobile phone for dedicated and convenient communication – wherever you are, whenever you need! 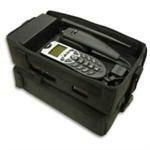 The M800 Bag Phone is designed for workers in the oil, gas, agriculture, forestry and construction industries. Click Here for Power Point Presentation. Motorola Privacy Handset Accessory plug-and-Play into your Motorola M800/ M900/ M930 cell phone model for a private conversation in your car. Motorola M800/M930 replacement battery. This is an aftermarket brand battery.